When I consult with my rhinoplasty patients, it is not uncommon that I might recommend for them to consider a chin implant, as well. 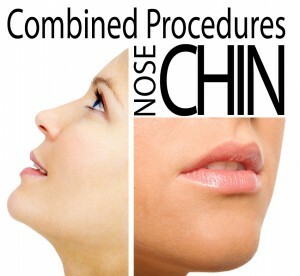 The combination of procedures is very beneficial, as it creates a balance to the patient’s facial features post-op. The original goal of rhinoplasty is to bring the patient’s nose into proportion with their other facial features. When a chin is too small, it may make the nose appear much larger. When combined with nose surgery, a chin implant can prevent the appearance of jowls or a double chin, creating improved harmony in the overall appearance of the facial features. For facial plastic surgery patients who are already seeking to have both procedures, I might recommend having the surgeries at the same time to reduce recovery time for the patient, as well as costs. Each patient’s case is unique and different, so I meet with patients in a consultation prior to surgery so I can create a customized treatment plan for them. My goal is to create a beautiful, natural-looking result that will leave each of my patients feeling happy and confident about themselves. To learn more about combining rhinoplasty and chin augmentation, or to schedule a consultation with Dr. Ali Sepehr, please contact The OC Center for Facial Plastic Surgery.